Successfully Added HK Warehouse Lenovo K5 Note Smartphone - 5.5 Inch Full HD Display, Epic 3500mAh Battery, Dolby Atmost Audio, 13MP Cam (White) to your Shopping Cart. The Lenovo K5 Note is the perfect choice for those who want more than just a regular smartphone. With its 5.5 inch Full HD display, powerful processor, and advanced digital sound technology, this is the smartphone that gives you a front-row seat experience when enjoying your multimedia activities. For those who want to take the most out of their phone’s multimedia capabilities and enjoy a truly cinematic experience, the Lenovo K5 Note is the excellent choice. Encased in light metal, this eye-catching smartphone has a vibrant 5.5 Inch Full HD display, enhanced Dolby Atmost audio, and is equipped with the latest digital sound technology. The device furthermore has impressive memory and storage capabilities with its 32GB internal memory and up to 128GB of external memory to ensure that you never run out of space to store all your favorite media files. Along with the high-quality cinematic experience that this smartphone can offer it comes with a powerful Octa-core processor - giving you the power to effortlessly download, stream, and watch all your favorite movies and series. The Lenovo K5 Note is furthermore equipped with an epic 3500mAh battery which is capable of lasting up to 6 hours, thus giving you the time to breeze through a movie or two on just a single charge. Besides its outstanding cinematic performance this Android phone naturally also takes the user’s experience to the next level when it comes to enjoying mobile games, Apps, and photos on its large 5.5 Inch screen. Thanks to its powerful Octa-core processor and with 3GB of RAM, the Lenovo K5 Note performs exceptionally – with seamless multitasking, smooth multimedia, and responsive gaming. Equipped with a 13 MP auto-focus rear camera with LED flash this phone lets you capture great photos and videos; while an 8 MP camera at the front can help make your selfies stand out from the crowd. Despite all its power, the Lenovo K5 Note has a smooth and modern design. Wrapped in a sleek platinum silver metal casing, this smartphone is sure to turn heads wherever you go. 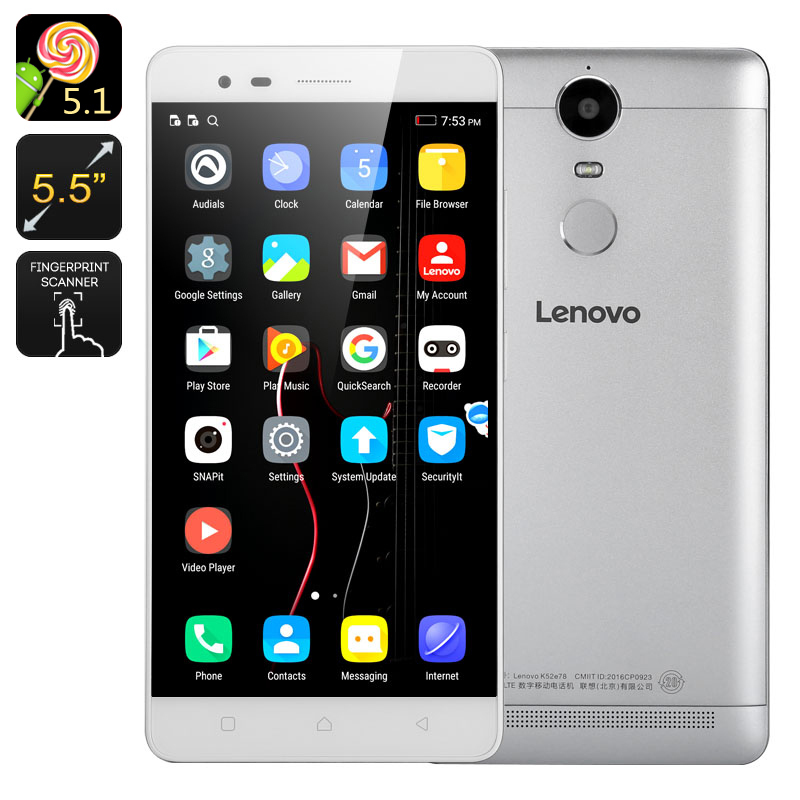 The Lenovo K5 Note Smartphone comes with a 12 months warranty, brought to you by the leader in electronic devices as well as wholesale Lenovo cell phones..